Sanshiro Sugata (姿三四郎, Sugata Sanshirō, aka Judo Saga) is the directorial debut of the Japanese film director Akira Kurosawa. First released in Japan on 25 March 1943 by Toho film studios, the film was eventually released in the United States on 28 April 1974. The film is based on the novel of the same name written by Tsuneo Tomita, the son of prominent judoka Tsunejirō Tomita. It follows the story of Sanshiro, a strong stubborn youth, who travels into the city in order to learn Jujutsu. However, upon his arrival he discovers a new form of self-defence: Judo. The main character is based on Saigō Shirō. 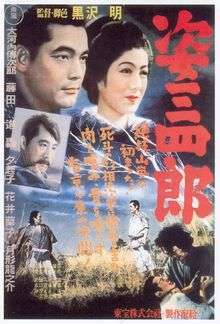 The film is seen as an early example of Kurosawa's immediate grasp of the film-making process, and includes many of his directorial trademarks, such as the use of wipes, weather patterns as reflections of character moods, and abruptly changing camera speeds. The film itself was quite influential at the time, and has been remade on no fewer than five occasions. It spawned a sequel, Sanshiro Sugata Part II, which was released in 1945 and also directed by Kurosawa. Following five years of second unit director work on films such as Uma and Roppa's Honeymoon, Kurosawa was finally given the go-ahead to direct his first film, even though he himself claimed that, in films like Uma, "I had been so much in charge of production I had felt like the director". After hearing of a new novel from the writer Tomita Tsuneo, Kurosawa decided the project was for him and asked film producer Iwao Mori to buy the rights for him. According to renowned Japanese cinema scholar Donald Richie, the reason Kurosawa was allowed to direct the film was because he had had two film scripts printed, including one of which had won the education minister's prize. However, his work was too far away from the government requirements for a wartime film. Tomita's novel, on the other hand, was considered "safe", dealing, as it did, with a Japanese subject such as the rivalry between judo and jujitsu, was a period piece, and was a popularist subject. Kurosawa deliberately went out to make a "movie-like movie", as he knew he would not be able to insert any particularly didactic qualities in the film. "This film has been modified from the original version of Akira Kurosawa's debut film, which opened in 1943, without consulting the director or the production staff. 1,845 feet of footage was cut in 1944 to comply with the government's wartime entertainment policies." The central theme of the film is the education and initiation of Sugata and the way in which, whilst learning the ways of Judo, he also learns about himself. The film's central scene concerning this theme is when, after being accosted by Yano for getting involved in a streetfight, Sugata leaps into the cold waters near Yano's temple and stays there in order to show his master his dedication, and the fact that he is neither afraid to live nor to die. Sanshiro Sugata has been remade five times since it was initially released, although these versions are even harder to find in "the West" than the original. The 1955 and 1965 versions share the script of the original versions, whereas the subsequent three releases are all based on the novel rather than Kurosawa's screenplay. Wikimedia Commons has media related to Sanshiro Sugata. "Sanshiro Sugata": Kurosawa's Elegy for the Reluctant Kamikaze at Bright Lights Film Journal.